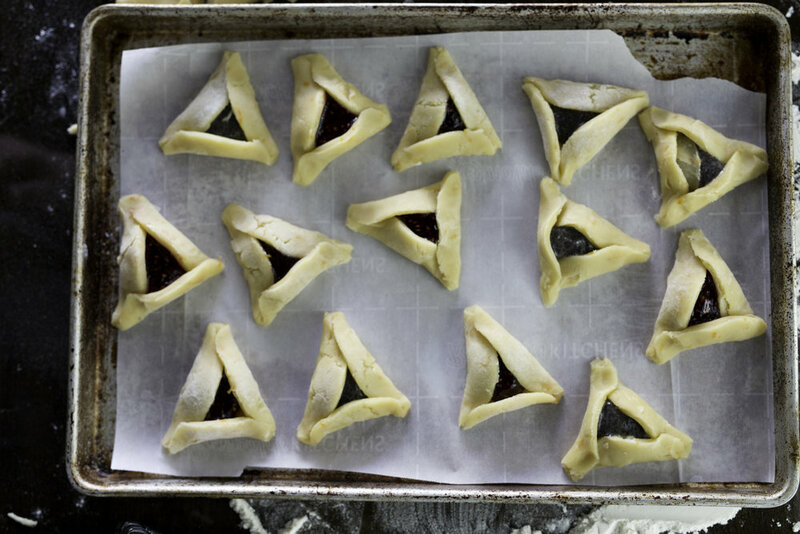 Okay, so hamantaschen might not be a staple cookie in the average American household, but it was in mine. This festive, fruit-filled cookie is usually made for the Jewish Holiday Purim. Now, I do realize that this post is coming in just a bit behind the holiday, but that has definitely never stopped me from making or eating something delicious. I should probably explain that my family has never been strict as far has religion is concerned. Both of my parents come from two completely different upbringings. So the main focus was always on celebrating different beliefs instead of forcing us to follow a certain religion. That same carefree attitude has passed onto food. For me, knowing where you come from is incredibly important; especially in a political climate that isn't always welcoming to differences. Your ethnicity and religious views should be a source of celebration. I am a second generation immigrant. My mom is from Cuba-- her family actually escaped the country when she was very little, so she has experienced a wide variety of cultures during her childhood. As they traveled and lived in different places like Spain and Puerto Rico before coming to the US, her family maintained a life as practicing Catholics. Even though my mom no longer observes the religion, I do know at one point of her life she took it very seriously. My Dad, on the other hand, is a mixture of German and Italian with a bit of Armenian thrown in there somewhere. My grandfather came from Germany and was Jewish. My grandmother came from Italy and was Catholic. There seemed to be a bit of turmoil with my father's parents on how to raise him. So technically, my Dad never had his Bar Mitzvah, but his family still observed all of the Jewish holidays. While I was growing up, we pretty much celebrated every holiday we could. So I was lucky enough to experience lighting my menorah during Hanukkah, along with searching for eggs during Easter. It led to a lot of questions, and in the end I was able to make up my own mind on what I chose to believe in. As grateful as I am that I wasn't pressured into believing in a certain religion, I am even more grateful that I have such a rich heritage. It has given me a better understanding of who I am, and has allowed me to experience such a wide variety of food… like these delicious buttery cookies!